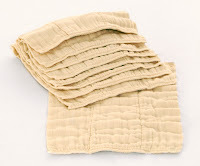 The Natural Baby – tagged "contour diapers"
I finally realized today why it can be tricky for some folks to remember the difference between "All in One" cloth diapers and "One Size" cloth diapers. All In One (or, AIO) to some people means the diaper is all sizes in one diaper. However, when speaking about cloth diapers, All In One implies that the absorbent layer(s) and the waterproof layer are somehow permanently attached. I talk to a lot of people about cloth diapers. A lot. I talk to people who have never used cloth diapers but want to, and people who used cloth diapers with their children in the 80s or in the 50s and wish they hadn't. Moms, grandmas, great-grandmothers, aunts, sisters, husbands, friends. You name 'em, I've spoken to them.